What you may have heard: White potatoes have too many carbohydrates, so you should avoid them and only eat sweet potatoes. What you are probably thinking: A nutritious food that is in season all year long — and is also budget and family friendly — is too good to be true. What the experts say: This delicacy, often associated with Ireland, is one of the best sources of potassium. Unlike Europeans, the typical American diet lacks potassium. When you lack potassium, you lack the essential element that helps with normal muscle function and your body’s water balance. Remember that your heart is muscle, and your body is made up of about 60 percent water. Why are you so wary about eating potatoes? Potatoes seem to be misunderstood, so it is important to get to the root of this issue. Potatoes have no fat, no cholesterol, and no sodium. They are vegetables (tubers to be precise) that are commonly associated as “high carb” since they are typically deep fried or covered in fats. Yet, one medium-size potato (5.3 ounces) is only about 110 calories. The heavy foods they are often topped or mixed with are the calorie and fat culprits. People also assume that they should avoid potatoes because they are a “white” food. Potatoes come in a rainbow of colors: white, red, orange, yellow, and blue/purple. No one is better than the other. 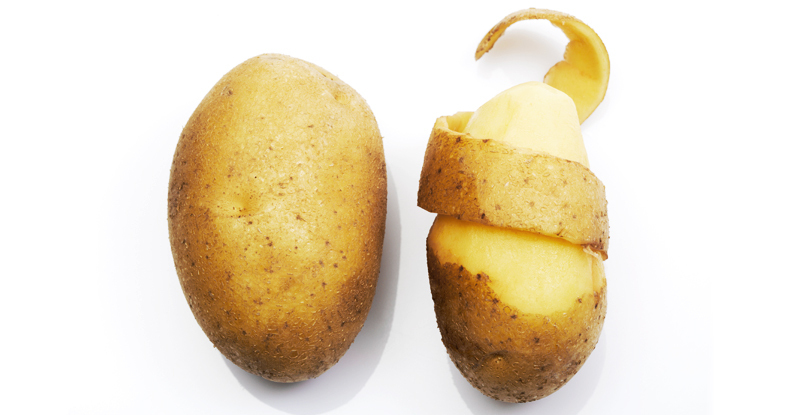 One medium potato with the skin has about 8 percent of the recommended daily fiber intake. Fiber and potassium are just the tip of this nutrition iceberg. They also have vitamin C, magnesium, manganese, and B vitamins. Orange-toned sweet potatoes are a great source of vitamin A, and purple-toned sweet potatoes are a great source of antioxidants. What happens if you stop eating potatoes? If you are not eating potatoes, you are missing out on a vegetable powerhouse. Potatoes have fiber, potassium, vitamins A and C, magnesium, manganese, and B vitamins. They contain no fat, no cholesterol, and no sodium. Potatoes are also budget friendly and delicious. Like any food, be mindful of portions. Again, this vegetable is a nutrition powerhouse. A common misconception is that white potatoes are like white bread or white rice. Bread and rice are grains, while potatoes are a fiber-packed vegetable. Fiber is great nutrient that helps control blood sugar levels. Studies show that a diet high in fiber can also help reduce the risk of developing type 2 diabetes. Which potatoes can you have? You want to reduce the amount of fried potatoes you have (for example, French fries or tater tots), but other than that, the rainbow of potato choices is a nutrition pot of gold. Research shows that children who consume potatoes have a more nutrient-dense diet overall. When potatoes are served, children also eat other vegetables. Key takeaway: When choosing your foods, remember to choose nutritious foods — and potatoes are packed with nutrition. News-Medical.Net. (2011, April 12). Children who consume white potatoes have more nutrient-dense diets. Retrieved April 2018 from https://www.news-medical.net/news/20110412/Children-who-consume-white-potatoes-have-more-nutrient-dense-diets.aspx. Harvard TH Chan School of Public Health. Fiber. Retrieved April 2018 from https://www.hsph.harvard.edu/nutritionsource/carbohydrates/fiber/.